In her younger days Gem was quiet the racer winning a Stakes Championship. She has been in a loving home but they were forced to rehome her. due to finances. Gem is a playful 8 year old who gets along well with cats and small dogs. She loves to chase squirrels in the yard and competes for 1st place while walking with her fellow greys. She does well with children but, would probably be best with children over 8 years. Gem seems to have a special affection for the man of the house and would be a wonderful pet for a retired owner or a stay at home parent. Gem cannot go an entire workday without going outside but, could probably easily learn to use a doggie door. She is well behaved, walks well on a leash, loves squeaky toys and is quite a love. 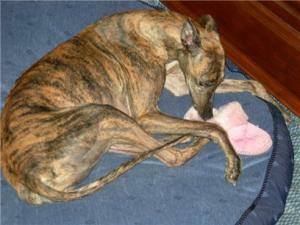 Gem has been selected as the recipient of GC member support donations, lowering her adoption fee to $200.